The Polished Blade has a ridge in the middle which the rest of the ring builds up to. A distinctive and beautiful tungsten carbide wedding ring, which comes in a 8mm width and comfort fit. This is a bevel to bevel version of our classic polished wedding ring. 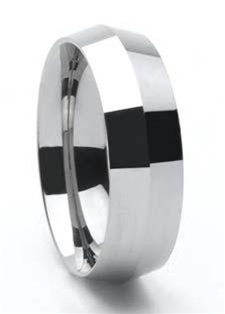 This timeless comfort-fit polished wedding band now comes in tungsten carbide. Similar to our other rings, our Tungsten Forever bands are considered permanently polished and the craftsmanship is absolutely incredible! Ships in 24-48 hours.